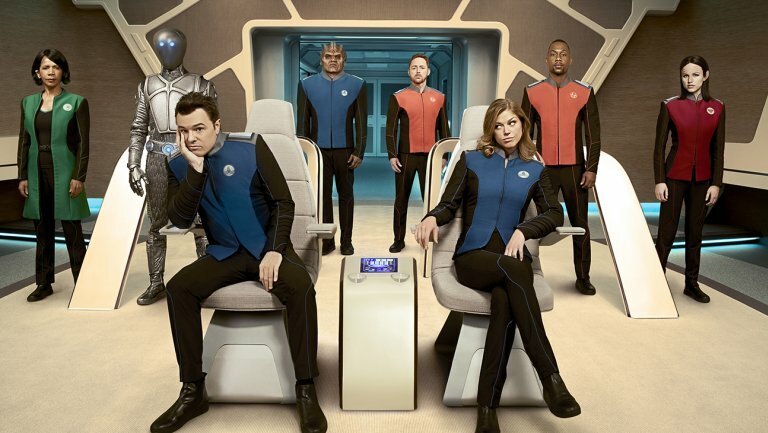 News from The Orville panel at NYCC 2017 – AiPT! Seth MacFarlane on the future of his series “The Orville” at New York City Comic Con 2017. On stage, the panel included series Executive Producer Brannon Braga (Star Trek: The Next Generation) and cast members Adrianne Palicki (Commander Kelly Grayson), Scott Grimes (Lt. Gordon Malloy), and Penny Johnson Jerald (Dr. Claire Finn). Comic-Con audiences were treated to two scenes from this week’s upcoming episode. The first involved the cast in the mess hall discovering, and then amusing themselves with, a new talent Bortus possesses. And the second featured Captain Mercer and Gordon flying a Krill shuttle and realizing a potentially fatal flaw in their plan. Regarding whether Mercer and Grayson have already resolved their issues, MacFarlane says to still expect a pattern of “tension and release” with those two. Adrianne Palicki also remarked that it’s an oddly similar relationship dynamic to what her character Agent Bobbi Morse experienced on Marvel’s Agents of S.H.I.E.L.D alongside an ex-husband.